Woohoo! I finally got some time to sit down and go over my Mama Voxbox I received from Influenster. This is my 2nd box I've received (I've only been a member for about 4 months.) So I fully believe that if you put the effort into this program, you will be rewarded. Below is my video review. In the video I cover what was in the VoxBox and also take some extra time going over the Dr. Scholl's product. Below the video review is my written review for Annie's Macaroni & Cheese Microwavable Cups. So the reason why I do not have this to show in the video above is because...I ate this Mac & Cheese the day I received my Voxbox in the mail. I literally couldn't wait to try it. 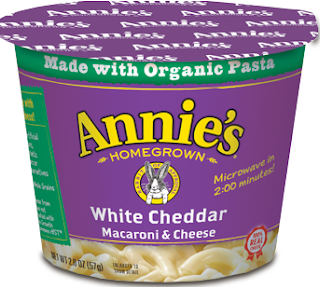 I love Velvita's Mac and cheese but know it is anything but natural ingredients and figured Annie's would be a better alternative. I was happy to find another microwavable product to add to my meals since I do not have a lot of time to spend at the stove these days. I did love the taste of the product. Once the cheese [powder] was mixed in and set, it was very gooey and delicious. The only thing I didn't like was the look of it after first microwaving the product. It just looked slimey and yucky. I thought that once I added the cheese powder it would look better... it still looked gross. I almost didn't try it, but then the cheese started to set and it started to look more like a yummy mac and cheese dish. If you can get past the look during the prep processes, this is a quick, yummy snack or meal.